The Aidan O’Brien-trained Fairyland claimed her third win from four starts when seeing off Brian Ellison’s The Mackem Bullet by a nose in the Lowther Stakes at York in August and it was a similarly close fought battle in this six-furlong Group One. Both horses were positioned prominently from the off, but 6-1 chance Fairyland looked to be travelling much the better entering the final furlong. However, 25-1 shot The Mackem Bullet refused to go down without a fight and there was just a neck between them at the line. O’Brien said: “We’re delighted with her. We thought she would come forward from York and she did. “She is a lovely filly. She was just back at York after having a break, having gone through the whole thing (bug at yard). They were all very sick. 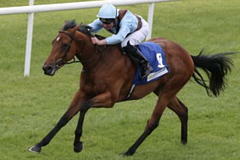 “Donnacha gave her a peach of a ride and she has loads of speed. We always thought she would stay and maybe get a mile, but she is not short of speed. Ellison was proud of The Mackem Bullet’s performance and is eyeing a trip to Churchill Downs. He said: “The Breeders’ Cup is on the agenda now. She is a good filly. She is one of the best fillies around. “That is three good runs she has put together now and I couldn’t see her being out the places today as I didn’t think there anything wrong with the Lowther form. Pretty Pollyanna was the 6-4 favourite to confirm her place at the head of ante-post lists for next year’s 1000 Guineas. The daughter of Oasis Dream could not add to her victories in the Duchess of Cambridge Stakes and Prix Morny, however, passing the post in fourth. Her trainer, Michael Bell, said: “The fallout is it’s disappointing initially. We had a good position in the first half-furlong and then Silvestre (de Sousa) tucked her in, which in hindsight was the wrong thing to do as she got beaten. “She perhaps didn’t come down the hill that well at that pace. She does have an entry in the Fillies’ Mile and we will talk to Bill and Tim (Gredley, owner) to see if she takes that up.